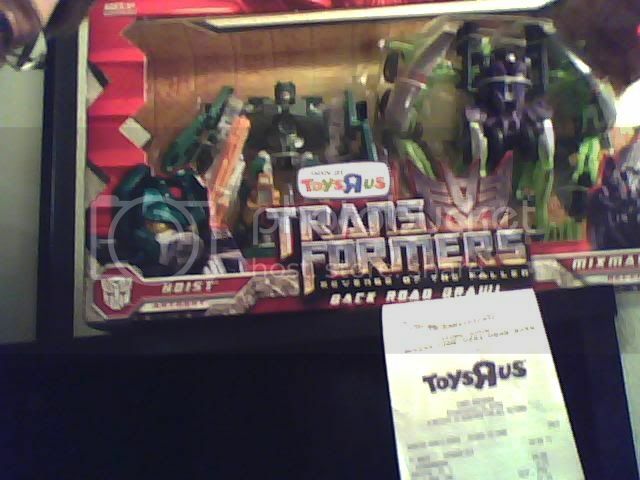 Transformers Revenge of The Fallen - "Back Road Brawl" Toys R Us Exclusive 2 pack is sighted at US. The set consists of G1 colour Mixmaster (ROTF Mixmaster repaint) and Hoist (Transformers movie Longarm repaint). Seibertron member reluctantyouth has found this exclusive 2 pack in Bloomington, Illinois. 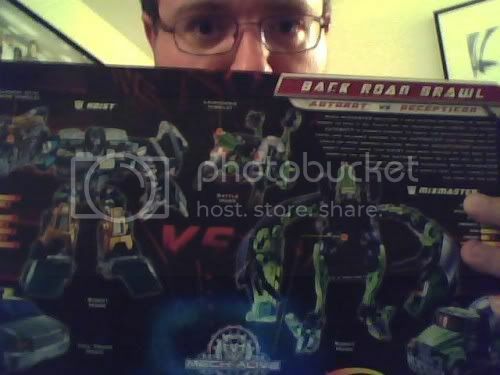 I wanted to let everyone know that I found the TRU Exclusive Back Road Brawl Set with G1 homage Hoist and Mixmaster. The set is priced at $34.99 I found the set in Bloomington, Illinois on 09/18/09. The set had just hit the shelf and apparently comes in a box of 4. I couldn't believe my eyes when I saw it. The paint apps on Mixmaster are not spectacular, but Hoist looks really good! There are 3 left as I couldn't afford to buy two sets. Happy Hunting! Please see photos for proof of purchase." Stay tuned to Seibertron for all the latest Transformers news and updates. Nice, hopefully this hits the Western states soon too. Just a heads up, your Visa card's last 4 digits is still showing in that 2nd pic. Still on the fence. Mixmaster looks great, but I don't really want/need Hoist. I'll be checking with my local TRU with this. This is BIG on my WANT list. Excellent find! Hoist looks great. Wonder when these will be up on TRU.com? Back Road Brawl > Masters of Metallikato. Blurrz wrote: Back Road Brawl > Masters of Metallikato. Agreed. Hasbro would have probably made a killing if they made Hoist a general release. I don't get why they make these box sets. If they were cheaper than buying the same figures separately I'd understand, but it's about the same price as a deluxe and voyager together. I would consider getting the Mixmaster, but not when I have to pay for another figure I don't want. Evil_the_Nub wrote: I don't get why they make these box sets. If they were cheaper than buying the same figures separately I'd understand, but it's about the same price as a deluxe and voyager together. I would consider getting the Mixmaster, but not when I have to pay for another figure I don't want. You can share the costs with someone that only wanted Hoist I guess. what does it say on the back of the box??? ?